Line a 9″ round cake tin with double thickness greaseproof paper. Tie a double layer or brown paper around the outside of the tin. Fold in flour and fruit etc. You can add a drop more whisky at this point if you like but not too much. Put into the lined tin and tap tin on worktop a couple of times to get rid of air pockets. 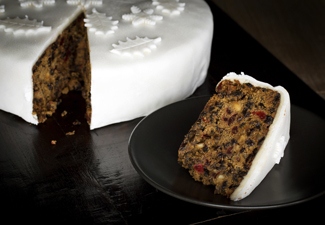 Wrap in greaseproof paper and store in large tin until your Christmas cake is ready to use. Keep cake upside down so flat top is uppermost. Roll marzipan into lengths and gradually cover sides of cake, smoothing and joining top and bottom as you go. Leave for a few days to dry out. Gradually add egg whites, glycerine and enough lemon juice to make a pliable icing which will hold peaks for rough icing. Place 1 teaspoon of icing onto the cake-board and place cake firmly on the board so it stays put. Make sure it is in the centre. Add decorations before icing has set. When completely dry store in airtight cake tin.